My hummus-month-co-creator (Ashley from the blog Dancing Through Life) is back with a hummus we invented this weekend. I really love this “huacamole” (aka. avocado hummus) and even had it in a gluten-free burrito this morning for breakfast along with black beans, onion sprouts, Daiya vegan cheddar, salsa, and chipotles. I think it’s even better as an ingredient or a spread rather than as a dip by itself. And who doesn’t want avocado + hummus? We started our date with a restorative yoga class. Since this is a hummus post, the only thing I’ll say is that it proved that Lindsay and I can make the best of any situation and we certainly warrant our #twosquealingsopranos hashtag (post-yoga of course). 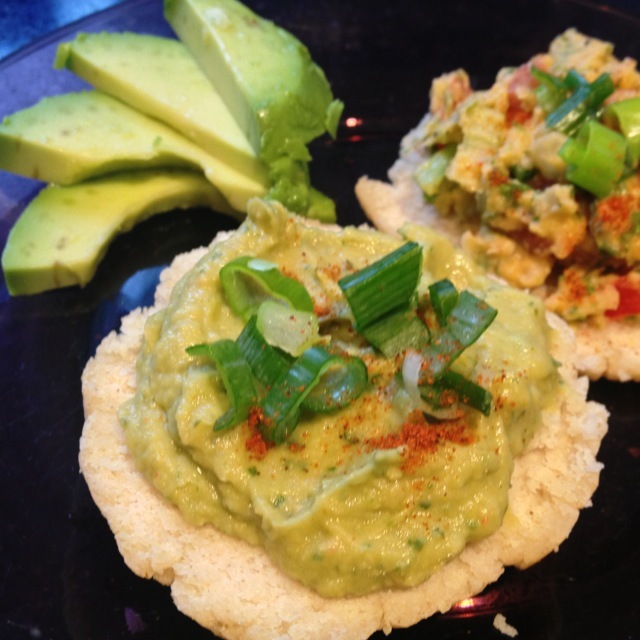 Back in the kitchen, sufficiently blissed out and giddy, we made (what felt like) a no-fail plan for avocado hummus / guacamole hummus / “huacamole”. Because avocado + hummus = delicious, right?! We agonized over hummus color, flavor, chunks vs. none. We added lime juice and cilantro for days and made jokes about bad guacamole. After having so much hummus success during the week, it seemed that we were coming up short once with this one! Have no fear, hummus lovers, we persevered and managed to tweak it to be something tasty and presentable, especially after some resting time in the fridge. Perhaps our hummus needed some restorative yoga too? The result was an avocado-y, lime-y hummus, with a distinctive green hue and a whole lotta cilantro. Thrown on an arepa with green onion and daiya, and this little green friend was pretty tasty. Our taste testers agreed, one even proclaiming “I would serve this at a party”. Hummus date #1 = success. Place all ingredients in a food processor and blitz until smooth (you may need to pause and scrape down the sides). Let chill in the fridge for at least 30 minutes before eating. Enjoy your huacamole — it is as fun to eat as it is to say. ← HUGE NEWS: My Gluten-Free (and Vegan) Bread-Baking Class is Online September 24th! that combines two of my favourite foods 🙂 I have to try this. I’ve had a great avo hummus before – somewhere. Can’t remember where. At the time, I thought it desperately needed jalapeno and cilantro. Glad you perfected it! Now, any plans for pumkin hummus? I like that as much as desert hummus. And yes… Pumpkin hummus (also requested by Heather) and dessert hummus are both on the list! It’s been hummus for every meal around here — and breakfast burritos with huacamole are my latest favourite! 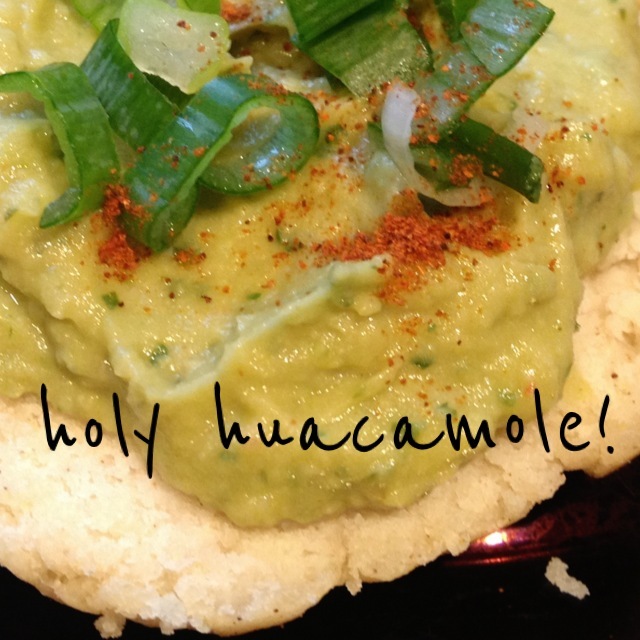 What a cute name – Huacamole!!!!! I love hummus and avocados together!!!!! We also invented “hummamole” — we’re having as much fun with the names as with the recipes! Nice! Glad your perseverance paid off, will definitely be trying this one! Holy moly, two of my favorite things! Sounds heavenly! It’s also called guacahummus, and you didn’t invent it. But the mix of great guacamole and delicious hummus is path to a divine joy.